Selin Kiazim and Laura Christie, founders of Oklava in Shoreditch, today announce their long-awaited second site: Kyseri will open in May and will showcase beautiful modern Turkish plates, drawing inspiration from both the Kayseri region as well as from Selin’s Turkish Cypriot heritage. 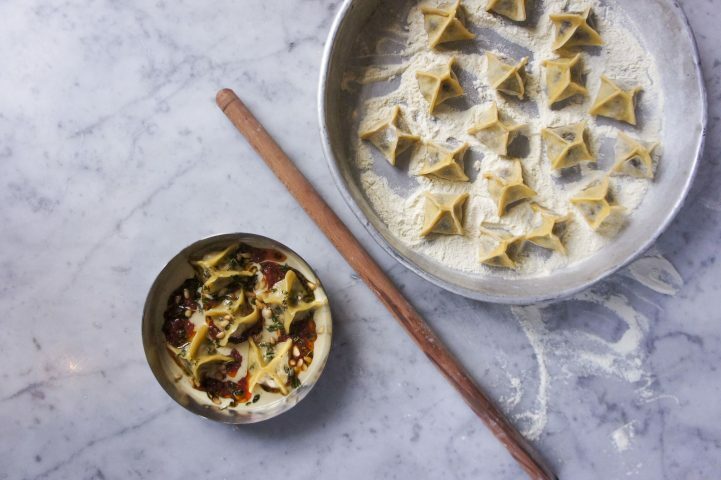 It will also have a focus on ‘pastas’ which will be made in the window of the beautiful central London location. Kyseri will open at 64, Grafton Way W1T 5DN, a hop and a skip from Warren Street tube station, off Tottenham Court Road. House-cured pastirma will also feature, not forgetting the pastas – here called manti (like little dumplings, pronounced ‘mant-uh’) and erişte (not dissimilar to tagliatelle, but this is broken. It’s pronounced ‘erish-teh’). Dishes will be offered in a 3 x 3 x 3 x 3 x 3 format, taking in ‘Snacks’, ‘Starters’, ‘Pastas’, ‘Mains’ and finally ‘Desserts’. At Kyseri, Selin will be showing off a perhaps lesser-known side to Turkish cooking, where people will be able to see pasta being made throughout the day, or perhaps the odd dessert such as her Pastachio and Kaymak Katmer.